ISLAMABAD: Leaders of religious parties on early Monday eventually reached an agreement with the government to amicably end 22-day long Faizabad sit-in staged by Tehreek-i-Labaik Ya Rasool Allah Pakistan. As per details, Federal Interior Minister Ahsan Iqbal and Federal Interior Secretary Arshad Mirza signed the agreement from government’s side while Allama Khadim Hussain Rizvi, Pir Afzal Qadri and Muhammad Waheed Noor signed the agreement from on behalf of the religious parties. The Federal Law Minister should resign through whose ministry amendment in the law relating to Finality of Prophethood was made. The TLYRA would not issue any Fatwa (verdict) against the minister. TLP appreciates the amendment (inclusion of 7B, 7C) made in Election Act along with the affidavit by the government on demand of TLYRA, however, report of Leader of the House in Senate, Raja Zafarul Haq committee will be made public within 30 days and action will be taken against the responsible for the earlier controversial amendment as per law of the land. All activists of TLYRA, who have been arrested/detained since start of Dharna (sit-in) from November 6, should be released within three days while cases against them be withdrawn. An Inquiry Board should be constituted in consultation with TLP to probe November 25 action of the government against the protestors. The Board should investigate, fix responsibility and propose legal action against those responsible for the operation. The damage to public and private properties from November 6 to until now (during Dharna time) should be compiled and financial loss in this regard be borne by the Federal government. Both the government and representatives of protestors also reached an agreement that the points relating to government of Punjab, upon which consensus had been made, should be implemented in letter and spirit. 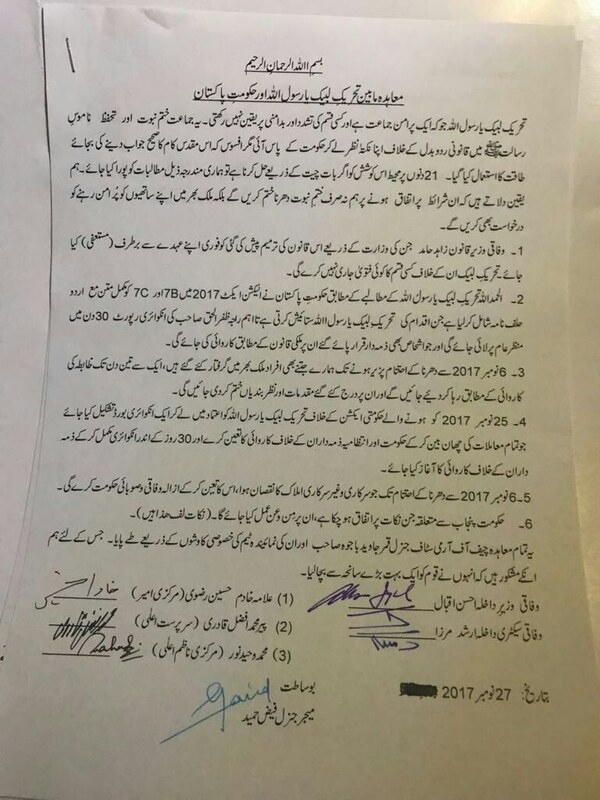 Zahid Hamid resigned as Federal Law Minister in face of countrywide protests and Faizabad sit–in by religious parties over the Khatam-e-Nabuwwat clause fiasco. Earlier on Sunday, civil and military leaderships decided not to use force against the TLYRA protesters staging a sit-in at the Faizabad Interchange of the twin cities of Rawalpindi and Islamabad. It was also decided that Rangers, not the army, will be deployed to deal with the sit-in issue.